Outlander fans, THIS IS NOT A DRILL. 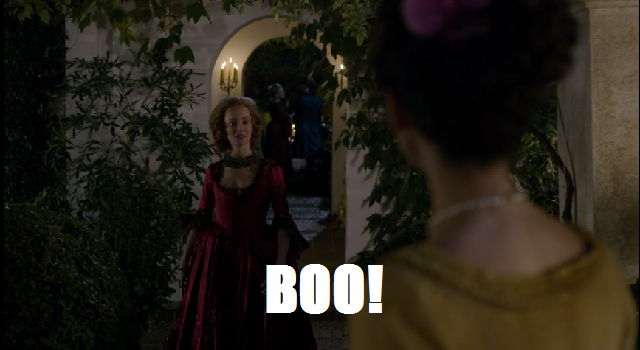 There is only one episode left of season 3 and I am already feeling the impending pains of Droughtlander. 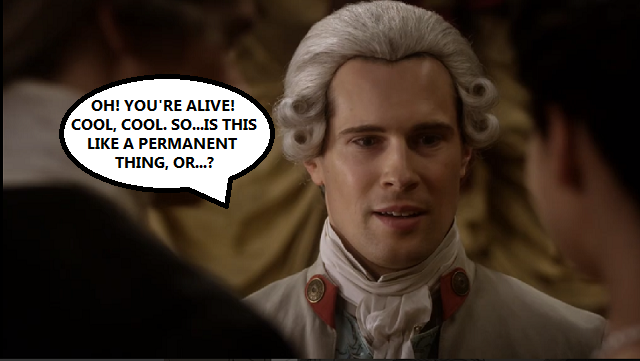 And on top of that, we had to spend 90% of the penultimate episode with JAMMF in a powdered wig! COULD LIFE BE ANY MORE DIFFICULT? Okay, Wee Ian. I see your point. You have it slightly worse. Episode 312, “The Bakra,” brought back a bevy of familiar faces, a heaping helping of awkwardness, and a heck of a lot of wigs. 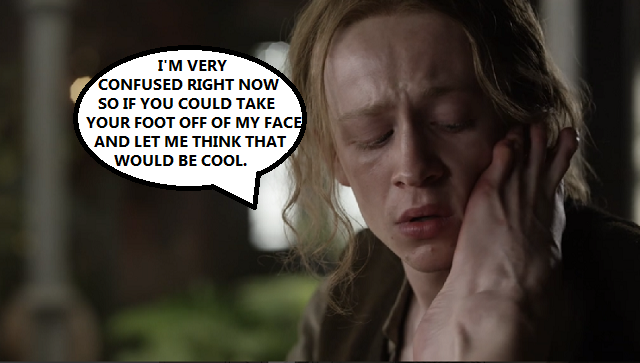 So before we cry into our goat’s blood, let’s break down the best of the best in this week’s Outlander Superlatives! 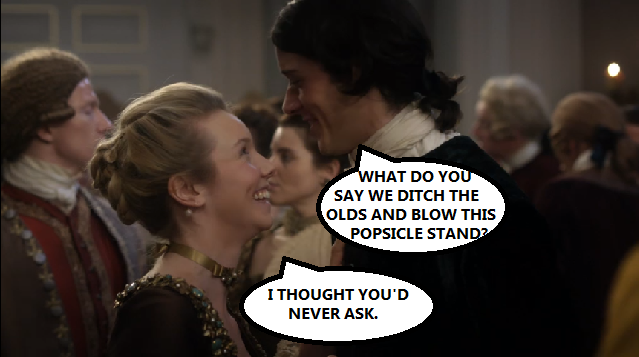 I am officially obsessed with all of the interactions between Jamie, Lord John, and Claire. There is so much awkwardness and love and jealousy and I LOVE EVERYTHING ABOUT IT. I also couldn’t stop singing Dolly Parton’s “Jolene” for two straight days after the episode. There is SO MUCH subtext going on between these three and I love every bit of it. 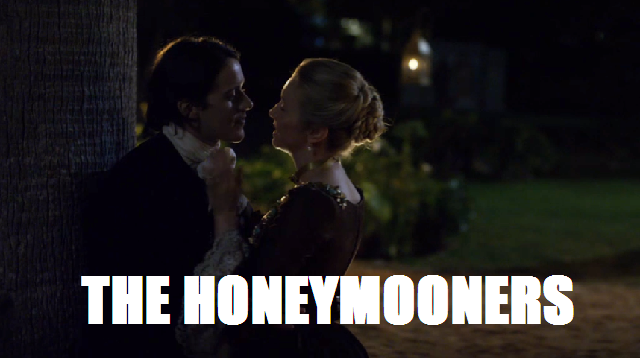 Claire has the man Lord John desperately wants. 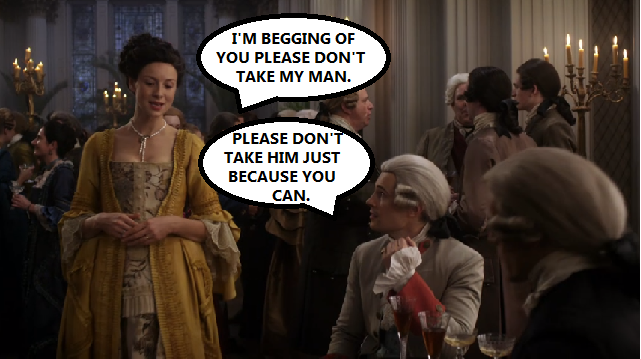 Lord John has a piece of Jamie’s life that Claire will never be able to share. 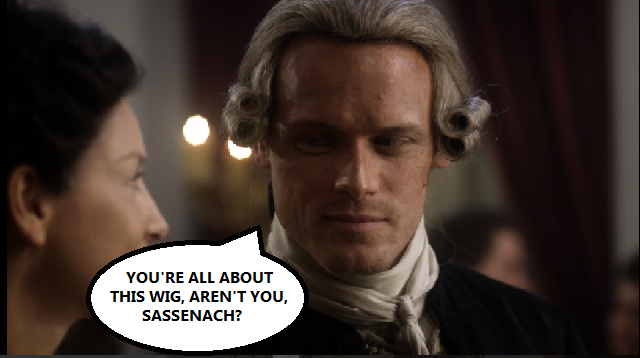 Jamie is super hot and looking fine even in his wig. Okay, maybe that’s not subtext, but it’s a FACTOR! 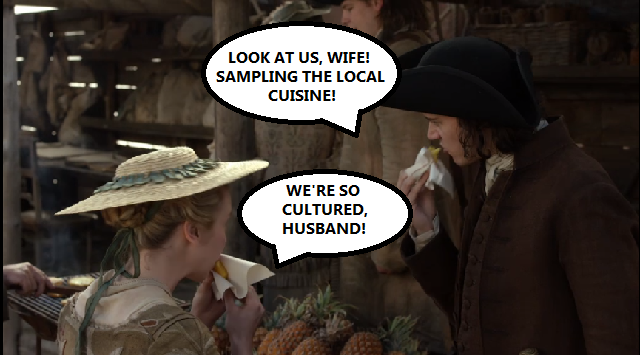 And yes, Jamie has told Claire all about Willie and how Lord John is raising him but I feel like there are some parts of the story that Jamie MAYBE LEFT OUT, if you know what I mean. And obviously Lord John is happy for his friend that the love of his life is NOT actually dead, but at the same time it’s got to crush his spirit a little. 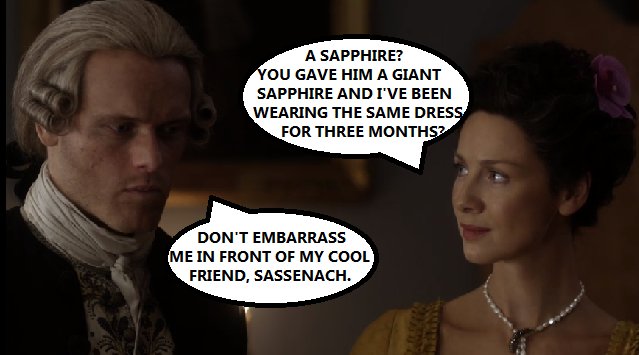 And let’s not forget the big pink elephant in the room: the giant sapphire Lord John is so proudly wearing. These three. Gotta love ’em, am I right? P.S. 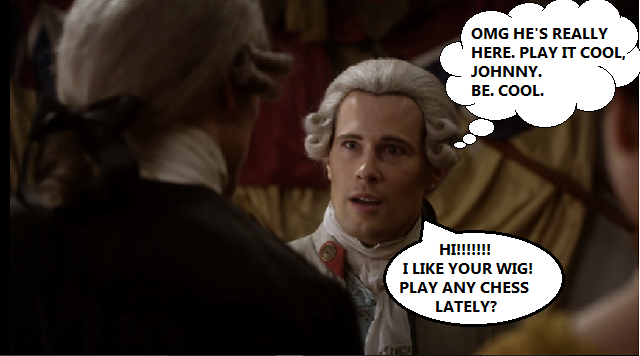 I love, love, LOVE Lord John Grey. He’s just such a good egg, you know? The Real Star of the Show: Ghosts! Geillis, and the Campbells, and Lord John, oh my! If the Frasers have learned anything it’s that once someone enters their life, there’s always a good chance of them returning. Look at these two. GET A ROOM, GUYS. In case any of us have forgotten how cray-cray Geillis can be, here she is bathing in “goat’s blood” (::::cough::::VIRGIN BLOOD:::: ) because it’s good for the skin. Joke’s on you, Geillie! 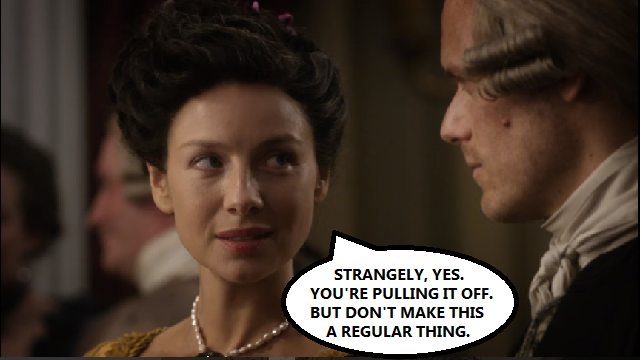 JAMMF and Claire haven’t stooped to such measures and they haven’t aged a day. The whole scene at the slave mart is horrifying and nauseating and I’m glad Claire tries to take down those disgusting slave traders with her parasol. 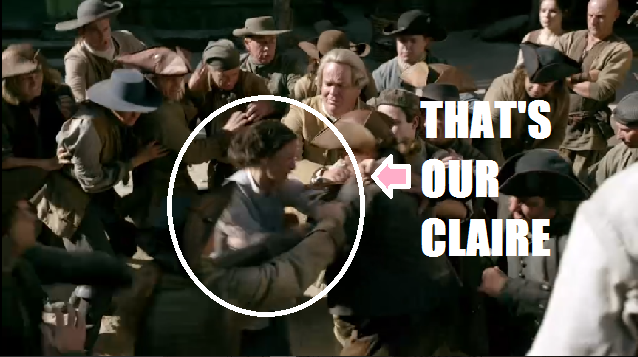 She wouldn’t be our Claire if she just stood idly by. 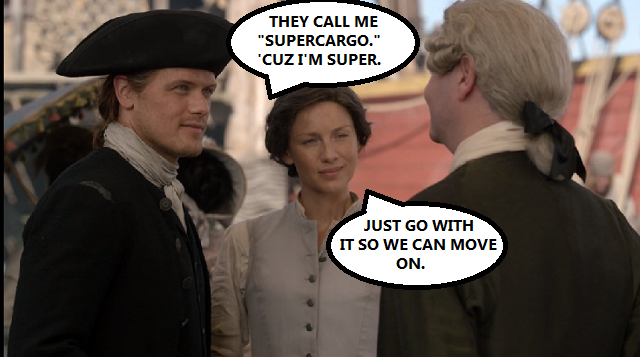 Is it me or does JAMMF love announcing himself as supercargo? Look at that little smile. He thinks it makes him a superhero. 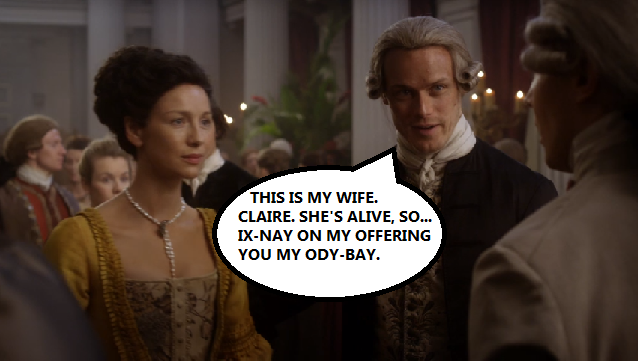 (And you are, JAMMF. YOU ARE.) Supercargo JAMMF is also our hottest JAMMF this week because this is one of the few times we see him without his Amadeus wig. Although, in fairness, he pulls it off better than most. You know what I love about Fersali? They’re making the most of this rescue mission and turning it into a mini-honeymoon in Jamaica. They even get to go to a party! But to be honest, I think they have other things in mind. I also think Marsali is loving being on the arm of the only wigless guy at the ball. 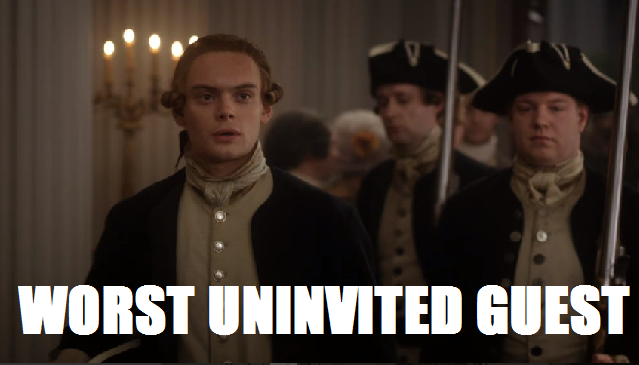 Lord John is just trying to have a nice party where he can mingle and show off his fancy sapphire. Then this little diva has to strut in like he owns the place. NO ONE WANTS YOU HERE, CAPTAIN LEONARD. GO AWAY.